I'm back at home in a strange daze, not quite sure what to do with myself after an incredible week spent with Young Rewired State Festival of Code. It was my first time leading a centre for YRS as a volunteer in my local area. The Festival of Code is a week long event where young (under 18) coders meet up and create a digital solution for a problem of their choice. On the first day our 4 young coders arrived, at the Eastleigh Tec Hub, all a bit nervous and not quite sure what to expect. Some had little coding knowledge but for the most, it was curiosity that brought them there. The two girls and two boys formed a team, brainstormed ideas and selected a project to build during the week. The rest of the week we spent building our project, a tool to help teens to choose an outfit for the day using weather API and uploading a database of clothes, aka helpdress.me. We had incredible mentors work alongside the kids, teaching them how to code, how to manage a project, how to save their code on GitHub, how to make priority decisions and how to present their project to an audience. By Wednesday the team was flying high. 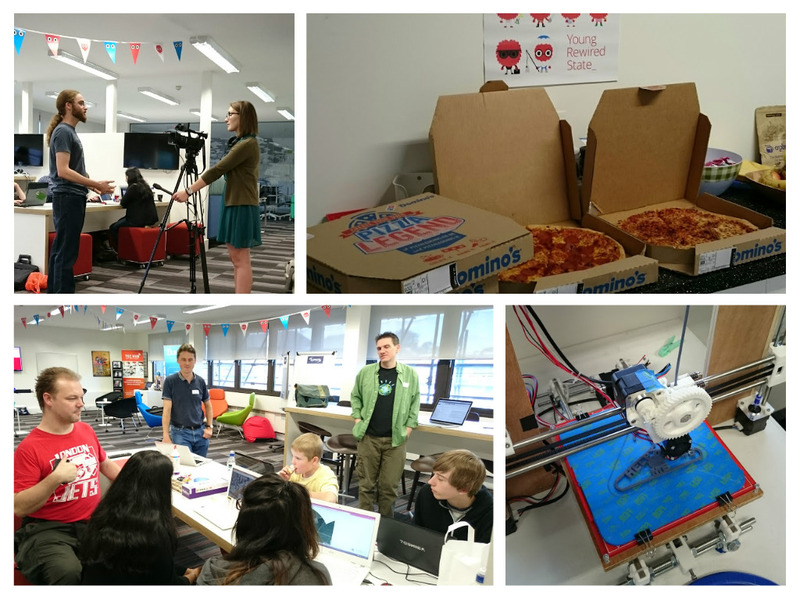 The arrival of a local TV show, filming our centre, and the sponsored pizza, from Dominos Southampton added to the buzz in the room. The kids even managed to create a logo for their idea and 3D printed it, with mentor, Ian McQueen's home-built 3D printer. It was finally Friday, where young people from all over the country, and as far as Norway and Germany, travelled to Birmingham for the big Festival Weekend. Over 1000 kids, spilled into the ICC still ferociously working on completing their digital creations for the competition. I had the pleasure of compering one of 10 presentation groups, each with approximately 20 projects. The creativity and talent presented in these heats was inspirational. Ideas from helping with flood-risk, to managing your fresh food in your fridge, to helping girls deal with cat-calling; I was blown away. The finals on Sunday was a show of the sheer competency of these young coders, with marketable ideas and working prototypes all dreamed up, designed and created in a week. I've been involved with Young Rewired State now for 3 years and believe in their cause to bring young talented coders out of their bedrooms and provide a platform for them to show off their skills, meet other like minded peers and learn from each other. Although the team from my centre, YRS Soton, didn't make it through to the semi-finals, they loved the experience. They all learned an enormous amount and will become ambassadors for the tech industry of the future. They came on Monday, not knowing much and left on Sunday inspired to continue to learn and improve their computer programming skills and search out new problems for which they can design solutions. The future of the tech industry lies in the hands of young people like those attending the YRS Festival of Code, and so we, as Tech Age Kids, are so proud to be part of this movement and help grow the next generation of digital makers. I thoroughly embraced my part in nurturing these young talents this week at Festival of Code and learned lots in the process myself.